With Meridian's birthday being just a little over a week away, we are quickly approaching the one year and twenty pound cut off for when to turn her carseat around to forward-facing. We won't though. We didn't with Zoelle either. In fact, Zoelle at almost 3 years old and 30 lbs. is still happily rear-facing. Being one year and 20 lbs. is not an accomplishment, it is just another milestone. 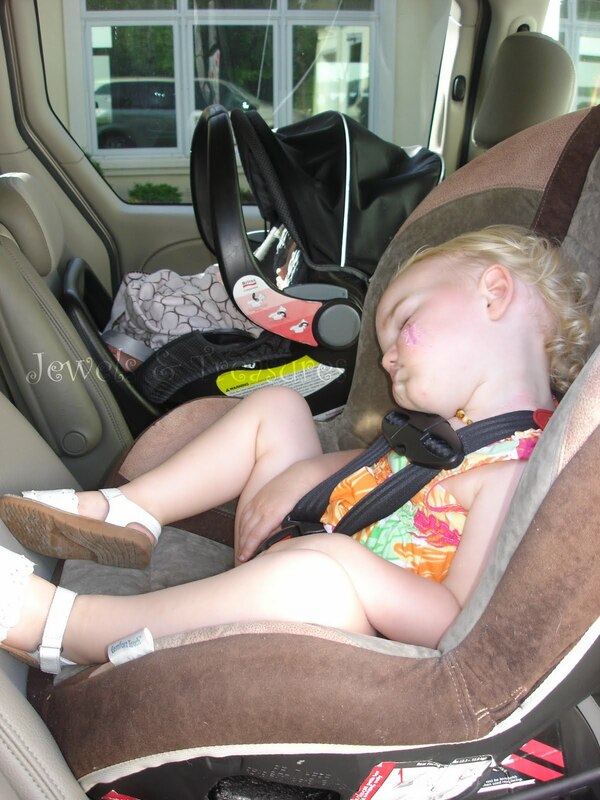 The American Academy of Pediatrics recommends that you should leave your toddler rear-facing until age two. However, as you will note above, Zoelle is almost three and still rear-facing. We don't extend rear- face only because the American Academy of Pediatrics tells us to. Instead, we do so because children riding rear-facing, are five times safer than those riding forward-facing. 5 times! That is alot! Overall, children under the age of 2 are 75% less likely to die or experience a serious injury when they ride in a rear-facing car seat. Since motor vehicle injuries are the leading cause of death in children, it's enough for me to keep my daughters rear-facing until the restrictions on their car seats no longer allow me to. Rear-facing seats are more likely to support the back, neck, head and pelvis because the force of a crash is distributed evenly over the entire body. Forward-facing children are more likely to be injured because the force of the crash is concentrated on seat belt contact points, and younger children’s heads are disproportionately large for their small, weak necks. One of the biggest questions I get about extended rear-facing is what about their legs being cramped. For us, our daughters have never complained about cramped legs. In fact, statistically speaking, it is much safer to have broken legs than to have a spine injury, or worse yet a broken neck in an accident. Around here, it seems that no one extends rear-faces. Most think I am crazy to do so. However, keeping my children the safest they could possibly be may be crazy to others, but is worth it to me. In fact, I am not the only crazy one. Many other countries, including Sweden and Canada are strong proponents to extended rear-facing and I am longing for the day when the United States follows suit to protect children. The best way to start is right in my own home by educating others about the benefits of extended rear-facing. It looks like your bigger girl might comfortably sit "criss cross applesauce". I guess she is not too uncomfortable or she wouldn't be asleep. Mine are all too big, but this makes good sense. Thanks for sharing your perspective (and research) on this. We have our 3-year-old forward-facing. Out 14-month-old is still rear-facing and we don't have plans to turn her around anytime soon. Maggie-I probably should have said that picture was from when the girls were 2 and newborn. But yes, she often sits "criss cross applesauce" and doesn't seem to mind. She rarely ever sleeps in her carseat and I honestly have no idea how she was here! :) Thanks for stopping by! Stephanie-I never knew any of this until Zoelle was a baby. A message board I was on started talking about extended rear-facing and so I started doing research (which I love to do) and found all this info on the benefits. Definitely something to think on. Our almost three year old is still rear-facing too. We are pondering changing directions in the fall (Maybe on his 3rd birthday, August 3rd) because we will need to turn it in the car when my husband is driving it full time -- he can drive it now when the seat RFing behind the driver's seat, but is squished. We have made the parental decision we are fine with him being FF (In the center) instead of trying to install behind the passenger seat, etc. Thank you for sharing!! This got me thinking about something I saw the other day. I shared it on my blog. Kendall turned one last month and we DIDN'T celebrate this milestone by turning her forward :) I also believe that rear-facing is the safest way for small children to travel in a vehicle and we intend to keep Kendall rear-facing until she is uncomfortable this way. Thank you for sharing! After reading about extended rear facing on several blogs we had already decided to do it once we get to that point (our daughter is only 5 months). I am also glad that major organizations/groups are now making statements about the importance of rear facing. I was, however, dismayed to see the news tickers to show the recommendation as 'rear face until 2 years' when 2 years is the minimum and the recommendation says 2 years minimum but ideally until your child reaches the height or weight limit for rear facing in their seat. I can't tell you how many people make comments that we have our daughter straps 'too tight' on her seat. They are snug they way they are supposed to be. People tell us that she must be uncomfortable in her snug straps to which I always respond that she is safe, and happens to sleep regularly in the car. At least I will be able to easily shut these people up when she is rear facing at 2+ years old. Woo hoo!!! !